The “dago” he was referring to was Clarrie Morelli – and Morelli was standing just metres behind him, eager to see for himself whether he was in the team. Luckily for the onlooker, Morelli was too excited by his inclusion to be unduly bothered by the remark. Instead, he was already dreaming about the following Saturday and the game against Richmond. Clarence Alexander Morelli was born in Bethanga, near Albury, the fourth of five boys, but spent most of his life answering to the name ‘Dido’ (a word used in an old Irish ditty that used to be sung to him by his grandmother). His mother, Mary, actually gave birth to twins when ‘Dido’ was born, but his twin brother did not survive. The family moved to Melbourne when Morelli was about seven, and settled in Collingwood. One day he went to watch one of his brothers, Arthur, play footy with Fairfield. The team was one short, young ‘Dido’ pulled on the boots and a few weeks later was a regular – keeping his brother out of the team. 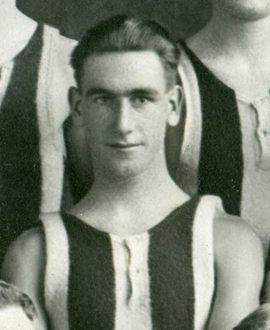 He was initially named on Collingwood’s training lists for 1926, but didn’t turn out properly until the following year, doing well enough to make his debut against Richmond in the third round of the 1927 season. He managed a further half dozen games before the year was out, doing reasonably well in several games, and it seemed like a good base from which to start a decent senior career. One newspaper bracketed him with Harry Rumney as the best of Collingwood’s new boys that year. But competition for spots was fierce at Victoria Park, and Morelli could manage only reserves games in 1928. Midway through the season he decided to head to the VFA with Northcote, but the Pies refused to clear him and he returned to play the rest of the season with the seconds. He returned to Fairfield in 1929, where he was best on ground in that year’s drawn Grand Final (Fairfield lost the replay), then to Wodonga with his job in the railways, where he coached Weir United to a Premiership against a West Albury team including Haydn Bunton and his three brothers. Other clubs followed as ‘Dido’ moved jobs. While Morelli’s Collingwood career didn’t last long, his attachment to the club did; he spent more than 50 years as a social club member and was heavily involved with the Past Players’ Association. His family recall him as “everyone’s favourite uncle” – bright, energetic, with a vibrant personality. He continued to walk to work in the city each day from his Clifton Hill home until well into his 70s. But he rarely spoke of his achievements, his own son not even knowing until he was 16 that his dad had played VFL football. And not just any football either – but as part of one of the most famous teams of all time. That’s the kind of modesty Collingwood has always liked in its players.